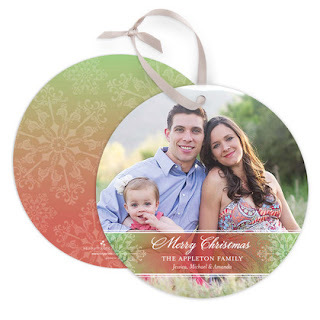 Tint Prints is known for its large variety of high quality personalized photo cards at affordable prices. Just in time for the 2011 holiday season, Tiny Prints has released an enormous holiday card line. With over 400 designs, you are sure to find the perfect card for your family! I love the colors on this card! It is a very unique design and I can picture it bringing smiles to the faces of all who receive this December. Now I just need a great family picture and I'll be all set:) The ornament style cards come with satin ribbon for you to personally attach to each card. You know this card will be displayed because it is just too cute not to! Disclosure: ABCD Diaries will be given holiday cards in exchange for this post. All opinions expressed in this post are ours and ours alone.